As appealing as the smell may be to your curious pup, keep trick-or-treat candies safely hidden from prying eyes and “extendo” paws. Chocolate contains a toxic compound called theobromine. Even small amounts can cause a dog to vomit, have diarrhea, and be excessively thirsty. It can also cause abnormal heart rhythm, tremors, seizures, and death. many candies contain a sweetener called xylitol that can cause more insulin to circulate through your dog’s body. This can least to a drop in blood sugar and liver failure. Also, many candies contain a sweetener called xylitol that can cause more insulin to circulate through your dog’s body. This can lead to a drop in blood sugar and liver failure. During the trick-o-treating rush, strangers dress in unusual costumes and scream loudly for candy. This can be an unwelcome distraction to your doggy. Some may become extremely scared and anxious, while others may act out aggressively to secure their territory. You never want to leave your pup alone in the yard at the mercy of pranksters. Although these items are basically nontoxic, if your pup was to swallow some he or she could choke or develop GI problems. Not to mention these large items could be knocked over and cause havoc in your home. Pureed pumpkin, however, is a good source of fiber and Vitamin A for your doggy. It also supports a healthy GI tract. 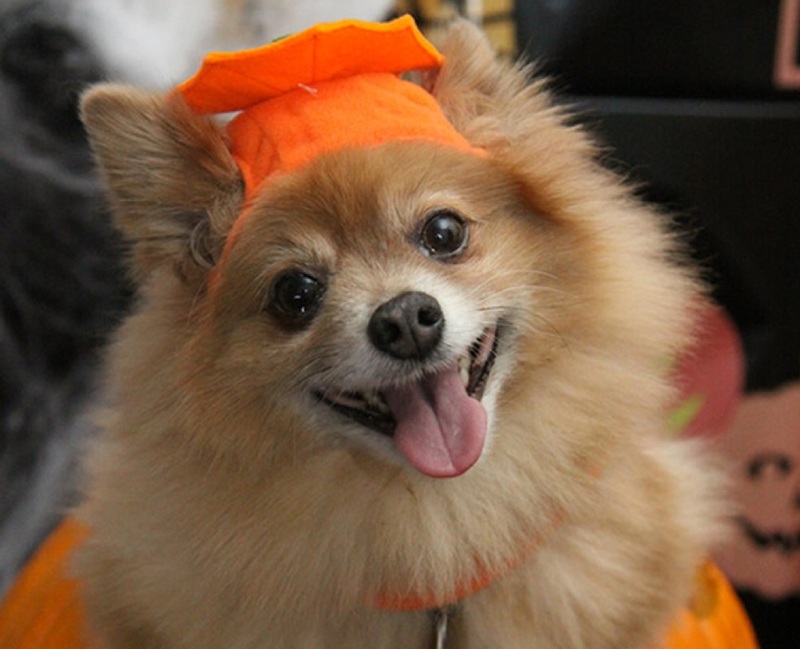 Try out this simple, homemade Halloween treat for your pup: Yummy Pumpkin Balls. Keep wires, electrical light cords, plastic and glass securely out of reach. If chewed, your doggy could cut himself or herself on shards of glass or plastic, or receive a life-threatening electrical shock. Keep your family’s Halloween costumes away from your pup who could easily swallow something dangerous. Plus, you may end up going to the festivities without a shoe! 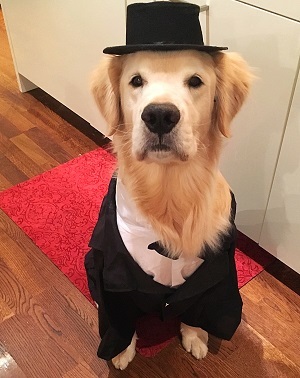 Just like you, some dogs enjoy being dressed up more than others. Be sure to choose safe costumes that do not restrict movement, hearing, or the ability to breathe or bark. And if your pup prefers to go au natural, a cute bandana will do the trick. Your dog should wear a collar with his or her identification at all times in case he or she was to get lost in the chaos. You should consider talking with your veterinarian about permanent identification such as micro-chipping and enrolling your dog in a recovery database.